Happy New Year! I can't resist but to share this specially for you. I encourage you to attend this learning opportunity. 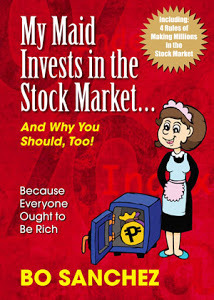 If you're one of the thousands subscribers of Bo Sanchez, and haven't attended and haven't started stock market investing yet, this year is your time to learn (muna), invest in yourself. Invest in your knowledge and education then test the water and apply what you have to learn this year 2015. Now! Read below and check the details here, click here. Do You Want To Be Equally Veeeeeeeery Happy Next Year Too? Being hugged by total strangers in malls and sidewalks. But they’re not really total strangers. They’re people who started investing last year—because of the guidance they get from me. Without warning, they run or walk up to me and hug me like I was some long lost loving Uncle they haven’t seen for 15 years. Friend, it’s now your turn. Change your financial future. Be veeeeeeery happy next year by investing in the Stock Market THIS YEAR. It’s not too late. You can begin now! 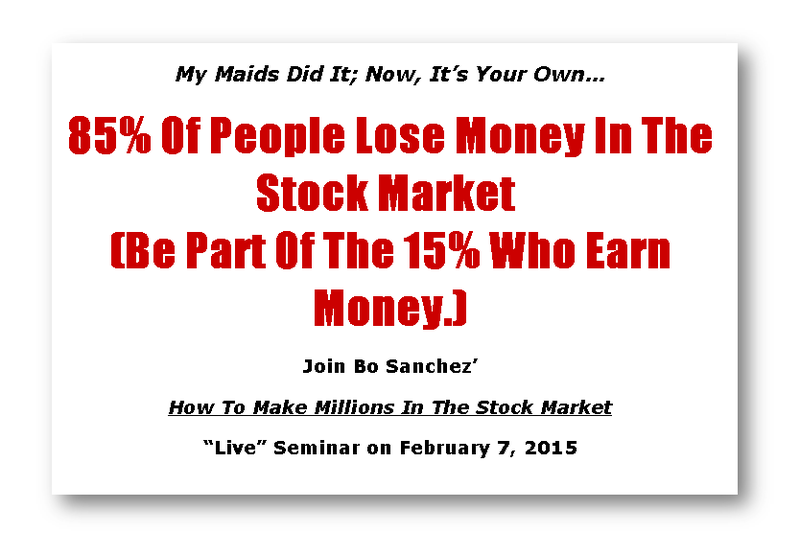 Join me in my How To Make Millions In The Stock Market on February 7, 2015, 8:00am to 12noonn in PICC (pre-registration through email is required). At the end of the seminar, if you don’t have a stock broker yet, you can open a ColFinancialaccount, the #1 stock broker in the country. My team will also guide you—one step at a time—how to operate their website and buy your first stock!